Whats in my All Seasons share? Much more than you may want to know. Posted 4/11/2019 8:15pm by Jill Rendleman. 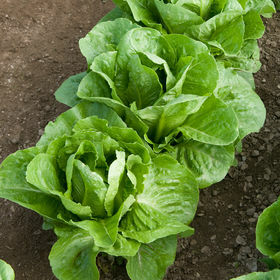 Members will enjoy two very different kinds of lettuces in their boxes this first week.....an emerald leaf lettuce, great for salads, on sandwiches, or as a wrap.....a very delicate mild flavor.......and a romaine, bolder in taste, best as a salad....the outer leaves being dark green, while the inner turn to a lovely light green to white.....making for a salad with impact. We used to grow the larger romaines, but found these European varieties that a small and compact and not including a lot of large stemy pieces typical of the large romaines. The Yukon Gold potatoes were over wintered on our farm and have a wonderful potato taste....dont ruin these potatoes with mashing or adding lots of other ingredients....a slow simmer in a pot of water with a little salt and olive oil or butter lets you experience the pure flavor of locally grown organic potatoes. These are also great for the Southern Illinois classic, fried potatoes and onions. My grandmother used lard, we use olive oil, slice the potatoes in 1/4 inch slices.....as they turn brown, flip them, when almost firm, add sliced onions and salt and braise together till done. We get our seed potatoes from an organic farm in main known for growing for flavor and no chemical additives. Full shares included parsley as well as cilantro.....the parsley being a great thing to cut up and put on your potatoes after they have been cooked. Cilantro seems sad without tomatoes, until you learn to add it to salads or your smoothies.....or make cilantro pesto....in a blender mix cilantro, olive oil, and pine nuts or pumpkin seeds......toss with your favorite pasta. The spinach, again, dont add a lot of ingredients, we love spinach this way.....heat up olive oil, add the spinach, toss after one minute, toss again, add garlic minced on last toss, then remove from pan, add salt. Eat alone or add to your Sunday morning omelet. This has become quite wordy......basic point, good fresh organic food does not need recipes, it just needs to be prepared simply so one can enjoy the pure flavor of the food. I try to limit my recipes to no more than 5, preferably 3, ingredients including the herbs. Simple, easy, great taste is the goal. ps. the flowers were Narcissus, picked this afternoon in the shade of our woods at the site of an old homestead. 150 years ago, someone thought enough of the future to plant a flower than would multiply over and over for generations to enjoy. Thanks to all returning and new members for making this first pickup go smoothly. We keep our CSA purposefully at 40 members maximum.....so that we can get to know each other and listen to each other. Please dont hesitate to call or text me anytime you have a question or concern....618-308-0217. Looking forward to a bit of rain tonight to water the garlic, kale, turnips, greens, etc in the outside beds.